The golden poison frog (Phyllobates terribilis), also known as the golden frog, golden poison arrow frog, or golden dart frog, is a poison dart frog endemic to the Pacific coast of Colombia. The optimal habitat of P. terribilis is the rainforest with high rain rates (5 m or more per year), altitudes between 100 and 200 m, temperatures of at least 26 °C, and relative humidity of 80–90%. In the wild, P. terribilis is a social animal, living in groups of up to six individuals; however, captive P. terribilis specimens can live in much larger groups. These frogs are often considered innocuous due to their small size and bright colours, but wild frogs are lethally toxic. The golden poison frog is endemic to humid forests of the Pacific coast of Colombia in the Cauca and Valle del Cauca Departments. Its range is less than 5,000 square km. It is only known from primary forest. The eggs are laid on the ground; the males transport the tadpoles to permanent pools. The largest morph of P. terribilis exists in the La Brea area of Colombia, and is the most common form seen in captivity. The name "mint green" is actually rather misleading, as the frogs of this morph can be metallic green, pale green, or white. The yellow morph is the reason it has the common name golden poison dart frog. Yellow P. terribilis specimens are found in Quebrada Guangui, Colombia. These frogs can be pale yellow to deep, golden yellow in color. A frog sold under the name "gold terribilis" was once believed to be a deeper yellow P. terribilis. However, genetic tests have proven these frogs to be uniform-colored morphs of Phyllobates bicolor. While not as common as the other two morphs, orange examples of P. terribilis exist in Colombia, as well. They tend to be a metallic orange or yellow-orange in color, with varying intensity. The golden poison frog's skin is densely coated in an alkaloid toxin, one of a number of poisons common to dart frogs (batrachotoxins). This poison prevents its victim's nerves from transmitting impulses, leaving the muscles in an inactive state of contraction, which can lead to heart failure or fibrillation. Alkaloid batrachotoxins can be stored by frogs for years after the frog is deprived of a food-based source, and such toxins do not readily deteriorate, even when transferred to another surface. The golden poison frog is not venomous, but poisonous: venomous animals have a delivery method for the toxin, such as fangs or spines, while poisonous animals and plants do not have a delivery method and rely on transference of the toxin, typically by, but not limited to, ingestion. Like most poison dart frogs, P. terribilis uses poison only as a self-defense mechanism and not for killing prey. The average dose carried will vary between locations, and consequent local diet, but the average wild P. terribilis is generally estimated to contain about one milligram of poison, enough to kill about 10,000 mice. This estimate will vary in turn, but most agree this dose is enough to kill between 10 and 20 humans, which correlates to up to two African bull elephants. This is roughly 15,000 humans per gram. This extraordinarily lethal poison is very rare. Batrachotoxin is only found in three poisonous frogs from Colombia (genus Phyllobates), nine birds from Papua New Guinea (including the genus Pitohui); and four Papuan beetles of the genus Choresine in the family Melyridae; C. pulchra, C. semiopaca, C. rugiceps and C. sp. A. Other related toxins, histrionicotoxin and pumiliotoxin, are found in frog species from the genus Dendrobates. The golden poison frog, like most other poisonous frogs, stores its poison in skin glands. Due to their poison, the frogs are deterrent to predators; P. terribilis poison probably kills any predator, except for one snake species, Liophis epinephelus. This snake may be resistant to the frog's poison, but is not immune (Myers & Daly, 1978). The poisonous frogs and birds themselves are perhaps the only creatures to be immune to this poison. Batrachotoxin attacks the sodium channels of nerve cells, but the frog has special sodium channels the poison cannot harm. Since easily purchased foods are not rich in the alkaloids required to produce batrachotoxins, captive frogs do not produce toxins and they eventually lose their toxicity in captivity. In fact, many hobbyists and herpetologists have reported that most dart frogs will not consume ants at all in captivity, though ants constitute the larger portion of their diets in the wild, likely due to the unavailability of the natural prey species of ants to captive frog keepers. Though all poison frogs lose their toxicity when deprived of certain foods, and captive-bred golden poison frogs are born harmless, a wild-caught poison frog can retain alkaloids for years. 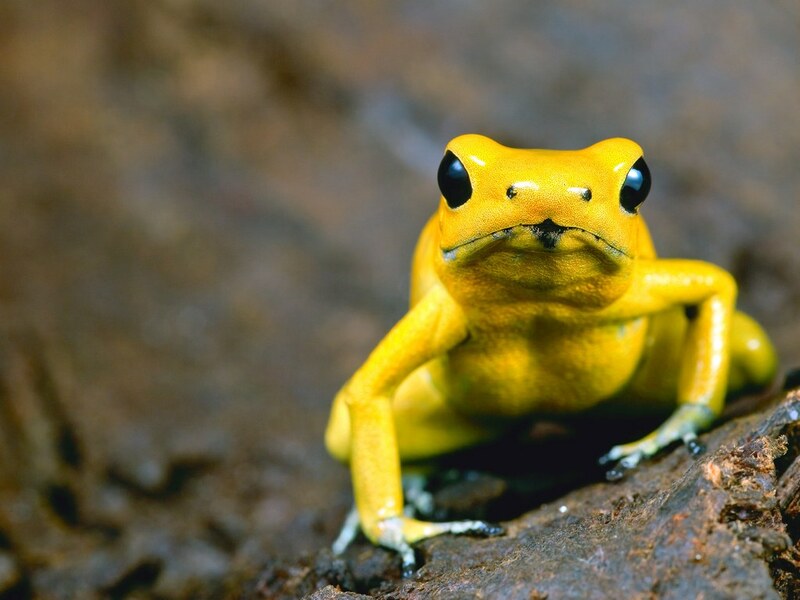 It is not clear which prey species supplies the potent alkaloid that gives golden poison frogs their exceptionally high levels of toxicity, or whether the frogs modify another available toxin to produce a more efficient variant, as do some of the frogs from the genus Dendrobates. Thus, the high toxicity of P. terribilis appears to be due to the consumption of small insects or other arthropods, and one of these may truly be the most poisonous creature on Earth. Scientists have suggested the crucial insect may be a small beetle from the family Melyridae. At least one species of these beetles produces the same toxin found in P. terribilis. Their relatives in Colombian rainforests could be the source of the batrachotoxins found in the highly toxic Phyllobates frogs of that region.